The Dalmatian is a breed with an incredible history that has accompanied Greek chariots and aristocratic European carriages. Remarkable stamina and pace are defining traits of the breed. Instantly recognisable due to his wonderful spotted coat and handsome good looks, the Dalmatian needs no introduction. Breeders and owners alike can’t get enough of his sparkling personality, high intelligence, and loyalty. 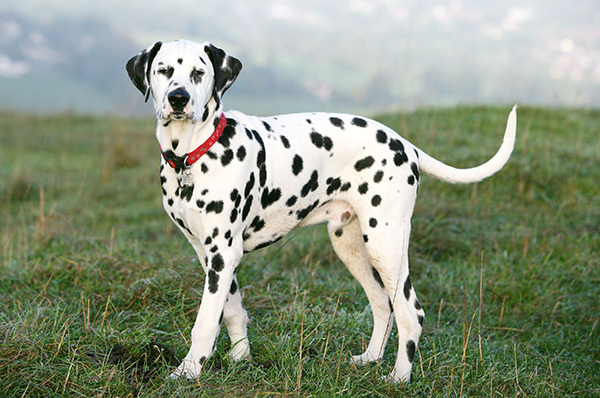 The Dalmatian is the 12th most popular breed in the Utility group. Dalmatians are known for their exuberant and playful natures, although this shouldn’t be confused with hyperactivity. They are not the type of dog to sit quietly; they want to be involved in everything that’s going on. They make excellent family dogs, but are quite strong, so care will need to be taken with young children. They will love all their family in equal measure, rather than attaching themselves to one person. Originally, Dalmatians worked as carriage dogs, running alongside to protect the occupants. Today the breed still tends to have a lot of stamina, which means that they need a reasonable amount of exercise — one to two hours daily — with plenty of opportunity to run. They may enjoy obedience classes, but as they have a tendency to be strong-minded, this isn’t an activity that will come naturally to them. However, that’s not to say they won’t enjoy it, provided there’s plenty of training and encouragement. Many also enjoy agility training and competitions. Dalmatians thrive on human companionship and will return the affection you offer them. For this reason they should not be left on their own for longer than two to three hours, so if you work full-time, then this is not the breed for you, as, in some cases, they will become destructive. Because they need plenty of exercise, they would suit a more active family. As Dalmatian’s coats are predominantly white, they can be prone to congenital deafness, and around 12 per cent of Dalmatians may be deaf in one ear, with a smaller number being completely deaf. However, responsible breeders will have their dogs checked with a Brainstem Auditory Evoked Response BAER) test to help ensure that affected dogs are not used for breeding. Dalmatians have also been prone to urinary stones and epilepsy, but, again, responsible breeders will routinely test their breeding dogs for these conditions. Dalmatians are born with pure white coats. Their trademark spots don’t start to appear until they are around three to four weeks old. Their short coats are easy to care for, but as they tend to moult all year round, you will need to groom them once or twice a week with a grooming mitt. This is essential as the short white hairs will get onto everything! If you’re considering getting a Dalmatian, it’s vital that you do your research and find a knowledgeable breeder who has their dogs and puppies’ health and well-being as their top priority. Dalmatians do not finish growing until they are around 15 months old.